Ghana Social Opportunity Project (GSOP) is a Labour Intensive Public Works (LIPW) under the Social Protection Public Works programs which has been instituted to provide employment and income earning opportunities to rural poor and underprivileged. Under the LIPW, the poor are enrolled to carry out works manually on essential community infrastructure and are paid wages for their labour. The LIPW project currently covers 60 districts nationwide and is mostly located in rural areas. The partnership with GSOP to introduce the electronic payment (e-zwich) to LIPW beneficiaries commenced in 2014 in Nabdam district with two (2) subprojects in the Upper East Region in a pilot phase. After the successful completion of the pilot exercise, 60 districts were introduced to the electronic payment platform (e-zwich) from 2015 to date. Funds transfers were via the e-zwich platform (PDS) to over Two Hundred (200) subprojects across the country. A total of Thirty-One (31) Participating Financial Institutions (PFIs) and its branches were identified and assigned to district (s) to provide e-zwich services to the beneficiaries in their subprojects. The Participating Financial Institutions are made up of; 28 Rural and Communities Banks/ 1Commercial Bank and 2Savings and Loans. In 2014, the National Service secretariat announced a new mode of payment for all National Service Persons. This was after a collaborative consultation between the management of GhIPSS and the National Service Secretariat. The e-zwich payment process arose out of previous experiences with cash based payments to service persons. It was considered that the use of the e-zwich Payment platform would provide an effective means of streamlining the payment process. The following process was therefore adopted to assist the secretariat to ensure that only deserving personnel who reported to their duty stations and showed up for work are paid allowances. Since February 03, 2015 GhIPSS has following the above process, validated and effected payments to over 42,000 NSPs from all regions/districts across the country. In September 2010, the Federal Republic of Germany through the German Federal Ministry for Economic Cooperation and Development and the Republic of Ghana decided to make available funds to promote the implementation of the e-zwich, especially in rural areas of Ghana. The objective of the project is to improve access to financial services to the benefit of the rural population. In January 2012, the respective project Agreements were signed between the Republic of Ghana, represented by the Ministry of Finance (MoF), the Bank of Ghana (BoG), GhIPSS and KfW. 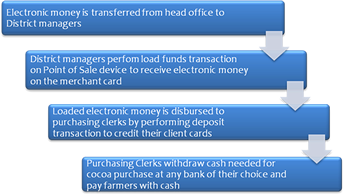 The project aims at migrating payments for cocoa from complete cash based to an electronic platform using e-zwich. This initiative was in response to COCOBOD´s request for a better payment system that reduces the risk associated with bulk cash movement to farming areas for cocoa purchases. 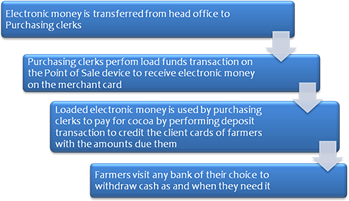 The e-zwich payment system also allows for accurate financial reporting on cash movements from the head office of a Licensed Buying Company right down to the farmer. The project began on a pilot base in the Volta region in 2012 with PBC limited and proved successful. Another pilot is being staged in Sefwi Wiawso in the Western region with all the 12 Licensed Buying Companies (LBCs) participating. The Livelihoods Empowerment against Poverty (LEAP) programme was developed by the government of Ghana as a flagship National Protection Strategy programme to empower extremely poor populations in the country. Leap is a cash transfer programme for the poorest and the most vulnerable households in the country with particular emphasis on households with orphans and vulnerable children, the elderly and severely disabled persons. It is a social cash Transfer programme intended to deliver to beneficiary household in a predictable and regular manner. Currently, the LEAP Programme is moved on to some electronic platform in Ghana.